Stamp images on white glossy card stock using Clear Resist Ink. Brayer over images with Creole Spice Kaleidacolor Ink. On a separate, small card, brayer background with Creole Spice ink. Using the same ink, stamp Happy Birthday. 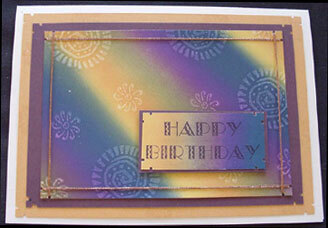 Cut corners with Southwest Punch and layer onto slightly larger, dark card. Cut all corners with Southwest Punch and wrap metallic cord to top piece. Layer as shown.